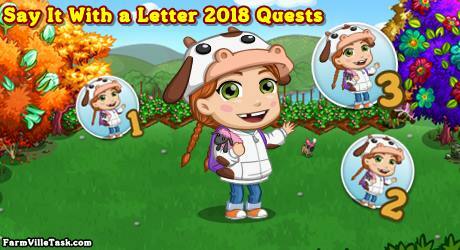 Our friend Barbara is visiting us this week in FarmVille Say It With a Letter 2018 Quests. She has a good idea on how to celebrate this event but she needs our help in planning this event. We will help her shop for the various things we will need in organizing this mission. On this FarmVille Quests, we will be crafting 9 recipes at the WINERY, BAKERY and SPA. Collect the bushels early so that you are ready once the quests ask for them. Note: Expected to be released on Thursday (November 29). Info: Crafted at the BAKERY and will need Carrotcicle Bushel x9, Sugar Cane Bushel x6 and Coffee Bushel x6. Info: Crafted at the WINERY and will need Licorice Plant Bushel x9, Peppermint Bushel x9 and Dandelion Bushel x9. Info: Crafted at the SPA and will need Aloe Vera Bushel x12 and Green Tea Bushel x12. Info: Crafted at the BAKERY and will need Peanut Bushel x4, Rice Bushel x6 and Sugar Cane Bushel x6. Info: Crafted at the WINERY and will need Tarragon Bushel x6, Rice Bushel x6 and Grape Bushel x4. Info: Crafted at the SPA and will need Blackberry Bushel x8 and Morning Glory Bushel x8. Info: Crafted at the BAKERY and will need Rye Bushel x8, Pink Rose Bushel x8 and Purple Poppy Bushel x8. Info: Crafted at the WINERY and will need Artichoke Bushel x1, Elderberry Bushel x3 and Rhubarb Bushel x3. Info: Crafted at the SPA and will need Lavender Bushel x2, Pink Rose Bushel x2 and Raspberry Bushel x10.